Bible commentaries are often huge and daunting-but they don't have to be. The Layman's Old Testament Bible Commentary from Barbour Books addresses key passages of Genesis through Malachi. With thousands of notes, covering the breadth of the Old Testament from the Pentateuch to the Minor Prophets, this commentary is concise and easy to understand-perfect for the non-scholar. 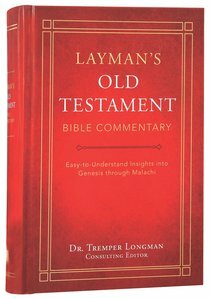 About "Layman's Old Testament Bible Commentary"